An Egyptian court sentenced on Tuesday 11 people to death, including one in absentia, in the retrial of the 2012 Port Said Stadium massacre case. Another ten defendants received 15-year sentences, 15 received ten-year sentences, and 15 others received five-year sentences. One defendant received a one-year sentence. Twenty-one defendants were acquitted. The defendants were found guilty on charges of premeditated murder and attempted murder of Ahly fans, thuggery, vandalism, theft, and show of force. Former head of Port Said security directorate Essam Samak and former head of the maritime police in the coastal city, Mohamed Saad, were among the 15 defendants who received five-year sentences. Masry football club official Mohsen Shata was also sentenced to five years in prison. The verdicts will be appealed automatically by the prosecution according to Egyptian law provisions on death sentences. The convicted can also appeal the verdict. In April 2015, the court had issued a preliminary death sentence for the 11 defendants. The court then referred the initial verdict to the Grand Mufti for a non-binding consultation, as per Egyptian law. Tuesday’s verdict comes after the court reviewed the Mufti's opinion on the death sentences. Seventy-three defendants, including nine police officers, were charged in the killing of 74 Ahly football club fans during a game in Port Said city in February 2012 between Ahly and Masry. 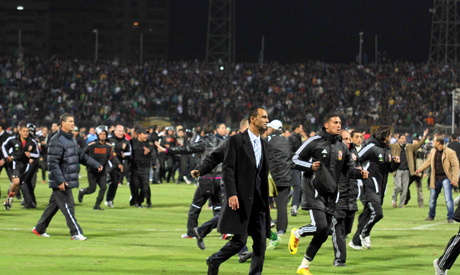 In January 2013, court sentenced 21 Masry fans to death, while postponing the sentences of 52 others for legal reasons. In Port Said, the death verdicts triggered clashes between angry locals and the police which left 40 people killed. Elsewhere, Ahly fans welcomed the sentences but criticised the court's failure to issue capital punishment verdicts for any of the police officers charged in the case. In March 2013, the court ruled on all remaining 52 defendants. It sentenced five people to 25 years in jail, and ordered lower sentences for the remaining defendants - including 15 years in jail for two police officers. Another 28 people were acquitted, including seven policemen. Almost a year later, in February 2014, the Court of Cassation accepted an appeal in the case, and ordered a retrial.